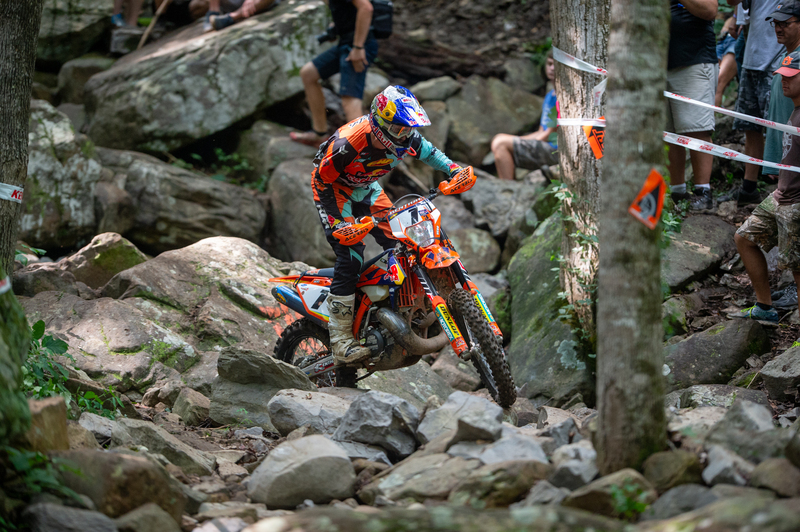 The Kenda Tennessee Knockout has become one of the premier off-road motorcycle races in the United States and many top international riders have competed in recent years. 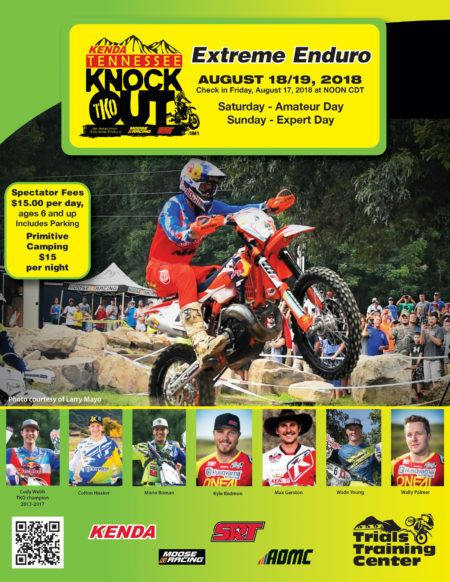 The ninth annual TKO will take place at the Trials Training Center in Sequatchie, Tennessee on August 16-18, 2019. FMF KTM’s Cody Webb has won the TKO for six straight years despite serious challenges from the top US and International riders. Germany’s Manuel Lettenbichler, South Africa’s Wade Young, the UK’s Graham Jarvis and Spain’s Mario Roman have all joined Webb on the podium in recent years but have not been able to knock Webb off the top step. Top North American riders including Kyle Redmond, Taylor Robert, Max Gerston, Jordan Ashburn and Cory Graffunder have also tried to unseat Webb and many of these riders will be back again in 2019. The TKO will feature both Saturday (Amateur) and Sunday (Expert) racing. The Sunday format will again feature a multi-round Knockout format that is challenging for the riders and very spectator friendly. The expert riders will be competing for a $10,000 purse. Any rider that finished in the top 26 on Sunday at the 2018 TKO will be qualified directly into the 2019 TKO Sunday program. 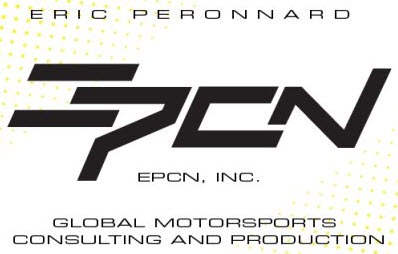 In addition, past TKO main event qualifiers and top off-road riders from other major US and International racing series and events will be invited directly into the Sunday program. The Saturday program will include two rounds of racing and will serve as the Extreme Enduro AMA Grand Championship for Amateur riders. 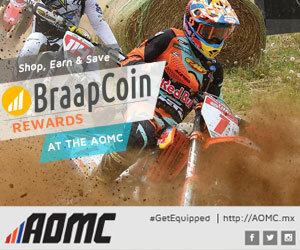 Amateur riders can earn spots directly into round two via several AMA regional championship events. Riders that do not qualify via one of the AMA regional events can sign up for one of 350 open spots that will compete in a morning qualifying race that can earn a spot in the championship final on Saturday. The top 30 finishers from Saturday will earn a spot in Sunday’s expert program. New for 2019, the Amateur riders will be given the opportunity to compete in a Friday afternoon “hot-lap” qualifying session to earn their starting positions. The qualifying session will be for both the pre-qualified riders (to set their starting position for race two) and those that enter the TKO amateur class to determine their starting positions for Saturday race one. Any riders that do not participate in the hot-lap will be lined up after those that participate in the hot-lap based on their sign up order. Amateur registration opens at 6:00 pm CST on Thursday, December 6, 2018. There are just 350 spots available and entries sold out in just a couple of hours in the past so please plan to get your entry in as soon as it opens. The registration link will be available here on the TKO website. There will also be a Women’s class with a Saturday morning qualifying session and Saturday afternoon main event.